When the Supreme Court invalidated a municipal minority business set-aside in City of Richmond v. J.A. Croson Co., it failed to recognize the special circumstances confronting the minority entrepreneur. Contrary to the Court’s own erroneous assertion that “[s]tates and their local subdivisions have many legislative weapons at their disposal both to punish and prevent present [business] discrimination ….” – they do not. Nor can they create effective antidiscrimination remedies as a practical matter. As a result that decision leaves minority business owners vulnerable to discrimination from other business firms but without a remedy. Part I identifies the glaring failure of existing legal remedies to reach discrimination in private business transactions. 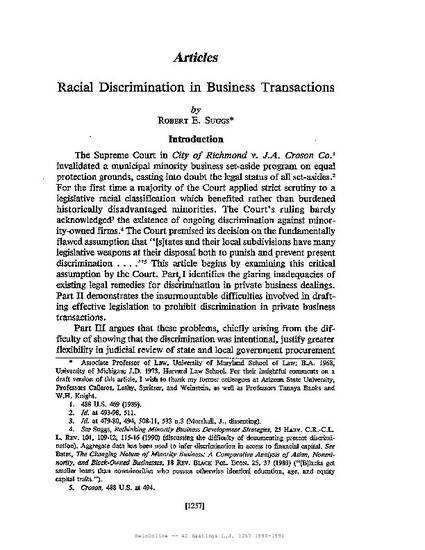 Part II demonstrates the insurmountable difficulties involved in creating effective legislation to prohibit discrimination in such transactions. It is noteworthy that no suits have ever succeeded with such claims, not even when government procurement was involved and Constitutional prohibitions applied. Part III argues that the essential problem with creating a remedy, showing intentional discrimination, justifies greater flexibility in judicial review of set-asides. Such flexibility is warranted because the same obstacles that impede redress in private actions for intentional discrimination in private commercial transactions also thwart the ability of jurisdictions to satisfy Croson’s required justifications for set-asides, precise factual showings of prior unlawful intentional discrimination. Private commercial transactions lack requirements for 1) public disclosure of business opportunities or the relevant specifications, 2) public opening and award of bids, and 3) mandating acceptance of the low bid. As a result, intentional discrimination cannot be shown without a confession from the guilty firm. 42 Hastings Law Journal 1257 (1991).